To ensure optimal up-time, administrators can install up to five ECMs on different Windows machines to communicate with the same site on the PRA Appliance. A list of the ECMs connected to the appliance site can be found at /login > Status > Information > ECM Clients. When multiple ECMs are connected to a BeyondTrust site, the PRA Appliance routes requests to the ECM that has been connected to the appliance the longest. 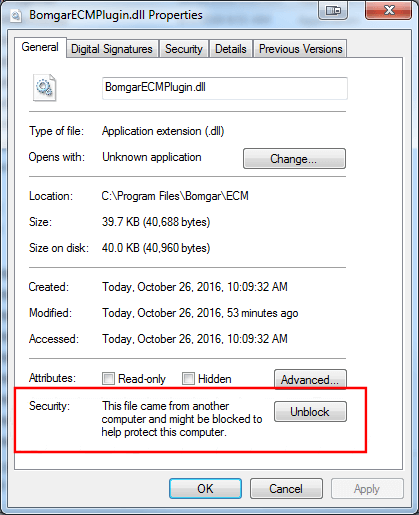 Once the BeyondTrust ECM is installed, extract and copy the plugin files to the installation directory (typically C:\Program Files\Bomgar \ECM). Run the ECM Configurator to install the plugin. First, ensure that the DLL is not blocked. Right-click on the DLL and select Properties. On the General tab, look at the bottom of the pane. If there is a Security section with an Unblock button, click the button. Repeat these steps for any other DLLs packaged with the plugin. In the Configurator, click the Choose Plugin button and browse to the location of the plugin DLL ThycoticSecretServerPlugin.dll. After selecting the DLL, click the gear icon in the Configurator window to configure plugin settings. The settings specific to Secret Server can be tested directly from the plugin configuration screen using the Test Settings button. Enter a user account from which to retrieve secrets. Enter an endpoint for which the user account has one or more secrets. No actual passwords are retrieved or displayed, only the list of credentials. The settings used for the test are the ones currently entered on the screen, not necessarily what is saved. Access to individual Secret Server user secrets is handled by a delegated trust feature built into Secret Server. This means that a user can grant access to their secrets to an API user. The first time a user attempts to access an endpoint via the BeyondTrust access console, a request for this access is generated, and an email is sent to the user. The user can either approve the request, granting API user access to their credentials for future sessions, or they can deny the request. This access can be revoked by the user at any time. If for some reason the email is not received, the page to manage this access is available to all Secret Server users under Tools > Manage Applications. When using the Test Settings button to test the retrieval of secrets for a user who has NOT approved access for the API account, the resulting dialog for the test is similar to the screen shot below. The Configurator.log should indicate that authentication was successful but that permission to access that user's secrets is pending approval. To avoid excessive authentication calls to Thycotic, the plugin caches (in an encrypted form) authentication tokens for users as they attempt to retrieve secrets through the integration. Subsequent calls use the cached token until it expires. At that point, a new authentication token is retrieved and cached. The Clear Token Cache button allows an admin to clear all cached authentication tokens if such action becomes necessary for maintenance, testing, etc.